Simple to prepare, this dish is perfect for busy weeknights without compromising flavour. Crispy fish fillets with a kick of Knorr South-East Asian Spice and an extra zing from some picked vegetables make this a hands-down winner! 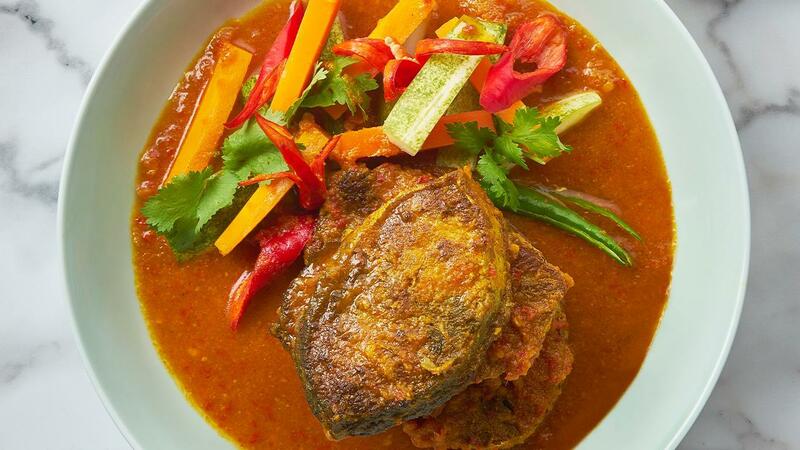 To prepare the fish, rub fish with salt, 1 tbsp of south-east asian spice paste, and lime juice. Set aside for 30 minutes. Once marinated, heat up oil in a wok to deep-fry the fish until golden in colour (but not too dry). Set aside. To prepare the paste, roughly chop red onion, candlenut, garlic, ginger, galangal, and turmeric. Then, transfer to a food processor. Add in chilli and process into a paste. Heat up the wok with margarine, and saute the lemongrass, salam leaves, and kaffir lime leaves till fragrant. Add in the blended paste and the remaining tbsp of south-east asian spice paste. Bring the heat up until the paste is bubbling, then lower the heat. Simmer until it is thoroughly cooked, fragrant, and the oil separates from the paste. Add in chicken bouillon, water, vinegar and rock sugar honey sauce. Cook till the mixture is boiling and the spice is slightly set. Add in carrot, cucumber, fish, and red chilli. Bring up the heat for a quick boil, and stir-fry for another 3-5 minutes till cooked through. Best served with fragrant steamed rice and garnish with crispy fried shallots and chinese celery.